Today let’s learn “How to Choose the Correct Ladder or Steps, for your above ground pool”. So you have decided to purchase an above ground swimming pool; now you’re wondering what type of ladder or steps to get. Let us explain the different choices available and the features of these designs. Most online and local pool stores will have an A-frame ladder included in their standard pool packages. This is usually a starter type ladder. 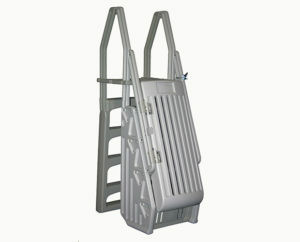 It is a simple ladder that is easy to build and place in the pool. The main purpose of standard package is to give a customer a basic package that contains all of the components to start swimming right away. When making a decision on which ladder or steps to purchase, take your future plans into consideration. Such as how you will access the pool, will you access from a deck or from the ground? Many people will get the A-frame ladder and then end up having to purchase a step system down the road when they build a deck. So they end up buying two entry systems opposed to what they need. 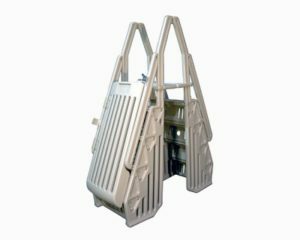 At the Above Ground Pool Builder we offer the upgraded “Confer-Plastics Roll Guard A-Frame ladder” in our standard package. This ladder is easy to assemble and is a very good start to our standard pool package, it lines up with bylaws pertaining to safe pool ladders. It comes with a roll guard slider to block off entry, as well as a lock and key when the pool is not in use. The best time to upgrade a ladder or steps is when you purchase the swimming pool package. Most pool outlets will allow you to upgrade items in your package, which will save you money. So which ladder should you get? Let’s get onto the different types of ladders and steps. This is a ladder that is designed to get you into a pool from a deck. One side attaches to your deck and the other end stretches into the pool. 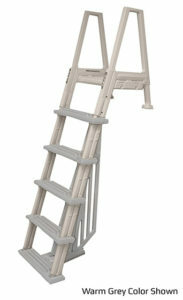 This is the lowest priced ladder offered and range in costs from about $100.00 up to $300.00. This ladder is designed in the shape of the letter “A”, one end sits on the earth, the other side stretches over the pool top rails and sits on the pools liner. There are hundreds A-frame ladders to choose from and they have a large price range, approximately $100.00 up to $500.00. Steps are the most popular entry system for an above ground pools. They attach to deck and go into the pool. Most people will have deck access and want these because they allow easy entry and exit. They allow children to easily enter the pool and gather in shallow waters. Pricing ranges from about $300-$800.00. 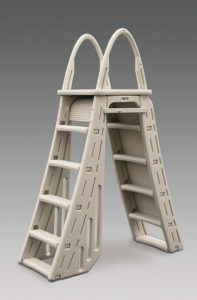 This type of ladder and step combination allows two different pool entries. This system allows either a ladder on the outside of the pool that attaches to steps on the inside of the pool. It can also be reversed so the steps sit on the ground and connects to a ladder going into the pool. 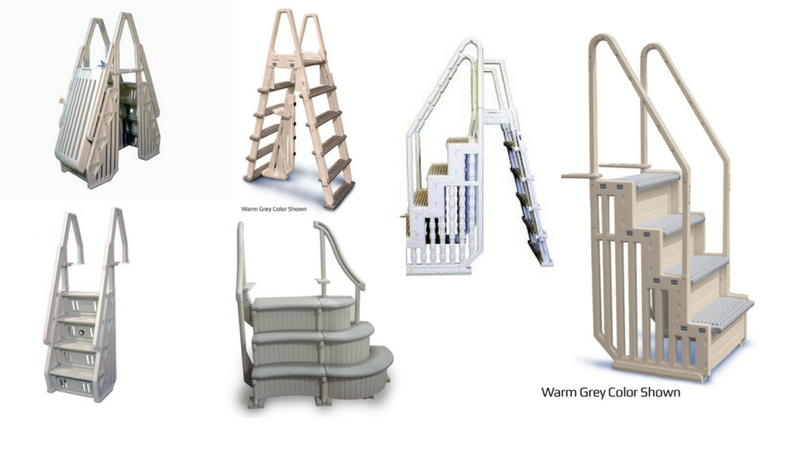 These are typically sold in kits which involve deck to pool ladders and steps being joined together. Ladder and step combinations can be costly with a prices ranging from about $300-$800.00. This represents either a ladder or steps leading from the earth onto a pool style deck. These are usually sold with resin or aluminum pool deck kits. This system has steps that sit on the ground and connect to steps on the inside of the pool via a bridge connection piece. This kind of system usually has a gate on the outside that can be locked when not in use. Step entry tends to be easier to climb for adults and young children. All separate components are put together as a kit system and is the most costly of entry systems and they range from $500-$1,200.00. It is important to figure out how you will enter and exit your pool, please consider the whole season in which you will use your new pool. Most people will install a pool, and then build a deck in the following season. If this is the case, you may want to consider a good A-Frame or combination system. If you know you’re going to build a deck soon, then you should ask for an upgrade step system and don’t forget to ask for a upgrade deal on the pricing. Across the country, cities and towns have various by-laws and regulations on pool entry systems. 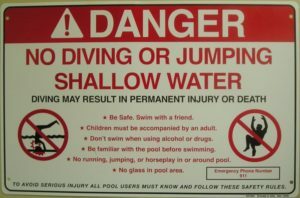 When you apply for a pool permit you will need to show how you will enter and exit your pool. It is a good idea to decide on your entry system ahead of time. Special note: It is not safe to dive into an above ground pool at anytime and it is not safe to jump off any of these steps or ladders shown here today.